About a month ago, Tom Anderson (or Myspace Tom, if you prefer) wrote a post on his new favorite social network, Google+, offering a few bits of advice for Twitter. While many of us enjoy a good Twittering now and again, Anderson pointed out that there are a few simple features Twitter might consider if it wants to boost the overall quality of its user experience. The main thrust being that the social experience of Twitter might be improved were the company to add a “discussion” or chat function that would, in Tom’s conception, give the viewer an input box by which to leave a comment and easily discuss tweets without flooding followers’ streams with one part of an on-going conversation. Well, Tom might just be interested in a new startup launching today, called Joint. Ok, well it’s not an exact replica of the Myspace founder’s idea, but it’s attacking the same pain point long discussed by Twitter users: In that the platform is badly in need of a better way to facilitate realtime, private, and longer-form conversations. Of course, there’s some disagreement among users over whether or not Twitter should be the one offering this feature, or whether it should stay simple, just as it is. To work towards this goal, Joint essentially turns any Twitter hashtag into an IRC (Internet Relay Channel)-like chat room, which is integrated with a realtime hashtag stream from Twitter. Check it out below. This combo allows users to participate in a number of different social interactions, including a front-and-center realtime group chat feature, which populates with a live hashtag feed in the right sidebar. Users can then pull the hashtags directly into the group chat, or invite the people who wrote the tweets into the group chat, right from the chat room, or simply hang out and enjoy synchronous chat, watching as the tweet stream populates. Compared to Hootsuite, Tweetdeck and other third party apps that let you track hashtags, being able to watch someone tweet from “outside” and bring them in and chat immediately is a subtle boundary and distinction proffered by Joint that really makes a big difference. If you’re trying to engage in a conversation with someone on Twitter that goes beyond a few “@ replies”, you’re either forced to DM or take the conversation elsewhere. 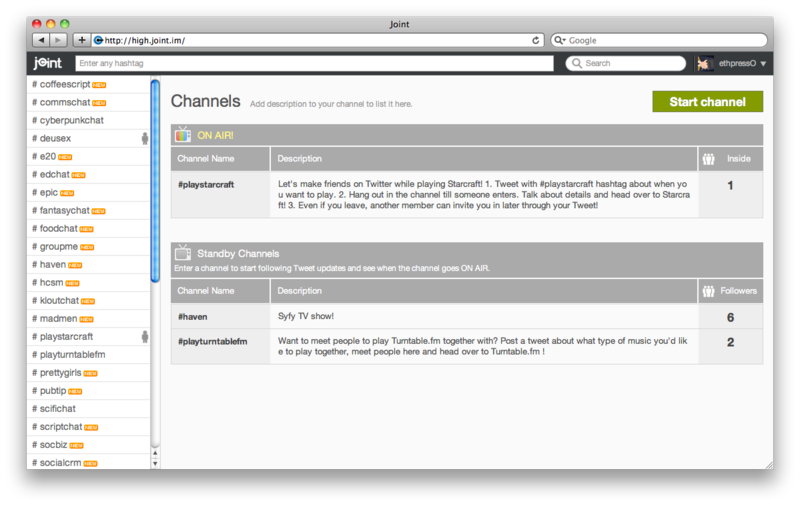 Joint allows users to easily join a group chat, as well as discuss notable or popular hashtags. For instance, of late “#irene” has become a much-used hashtag, as Hurricane Irene is poised to hit the East Coast. Joint could become a very useful resource for people looking to easily congregate and discuss ongoing situations like hurricanes, protests, or events, live, from any location. Another cool aspect of Joint’s platform is that it’s meant to function as an off-the-record conversation medium for Twitter users, meaning that if I’m having a conversation with someone and a third person joins the chat room, they won’t be able to see the ongoing conversation. This, Gahng says, is intended to make Joint group chat more reflective of interaction in the real world. As to Joint’s intended use cases, Gahng says that it’s easy to connect to other people on Twitter, but it’s hard to actually get to know them, so using Joint, you can meet someone on Twitter that you want to play Starcraft with — many of your followers may not want to join in on the fun. Which is why open standards warrior Chris Messina proposed the hashtag in the first place, but of course, not many people regularly follow hashtags in their day-to-day Twitter usage. Joint looks to change this by making it easy to search for different hashtags, discuss, and follow them synchronously in realtime. For an example, check out the Starcraft channel here. Not to mention the fact that, because tweeting with hashtags means that your tweets get archived and live forever on search engines, etc., many people feel uncomfortable about having public conversations (about more private issues, especially) on Twitter. We’ve all had to delete a tweet or two, and often too late. By giving Twitter users that added benefit of social flexibility, Joint hopes to give itself a leg up on other third party Twitter apps. Lastly, beyond simply being able to follow a hashtag group, Joint also informs a user when there’s a new user in their chat room, offers search descriptions, and gives users the ability to browse the main directory, or even start their own hashtag channel. 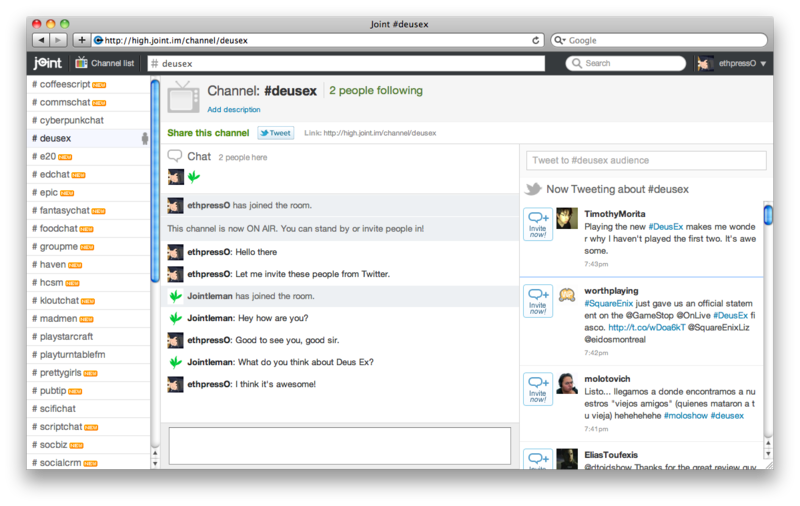 Joint solves a major pain point experienced often by Twitter users, and from my experience in the chat rooms and poking around on the site, the UI is straightforward, and chat is fast and easy to use. The three-person Joint team has been working on this since January, and the startup is bootstrapped at this point, but if the platform can scale and continue to function in realtime without glitches, this seems like something that can definitely have legs. Joint and its team isn’t affiliated with Twitter in any way, but I wouldn’t be surprised if the social network comes knocking at their door at some point down the road. For more, check out Joint at home here.